As we say goodbye to Winter and hello to Spring, it seems we only have a couple more months left before the kids are out of school for the Summer. I'm noticing a bit of less homework for my little ones, but one thing that the husband and I make sure they keep up with no matter how little homework they have is reading. We have our kids read for about 20 minutes a day about five days a week. 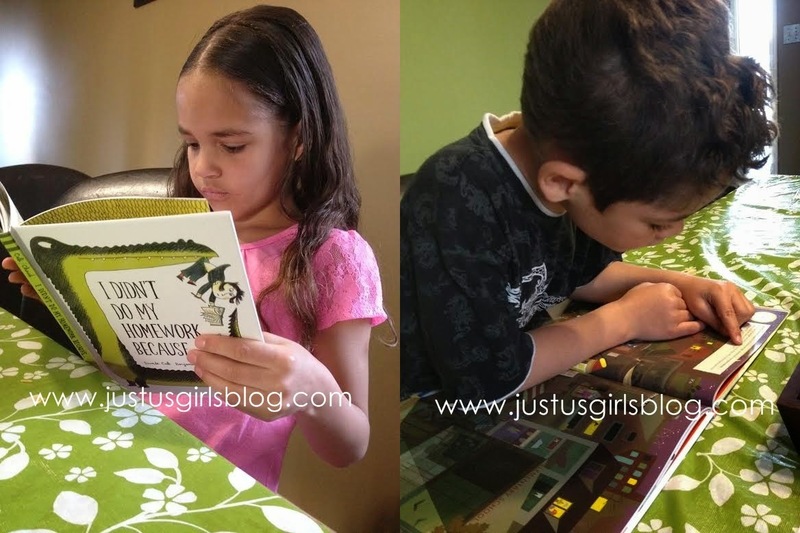 On days when they aren't reading, we love finding family books that we all can enjoy together and read as a family. We were all pretty happy when we got a delivery from Raincoast Books. 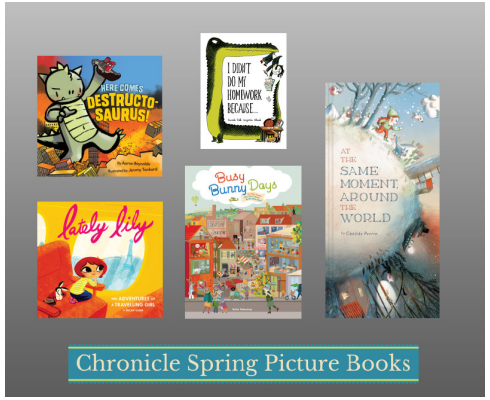 They sent us a collection of Spring picture books from Chronicle Kids that were both appealing from the pictures and from the stories as well. We were sent, I Didn't Do My Homework Because, Lately Lily, At The Same Moment Around The World, Busy Bunny Days and Here Comes Destructo-Saurus! 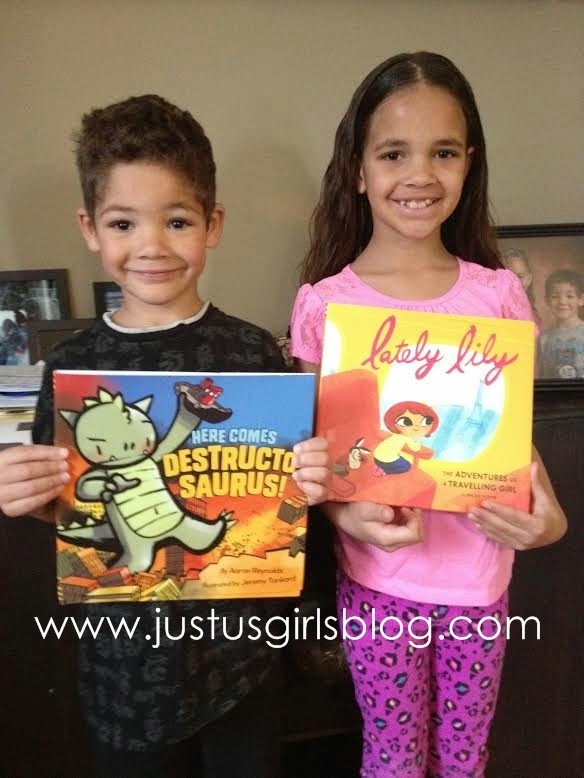 Each book was filled with beautiful colorful printed pictures along with great easy to read and follow stories that kept my kids focused on reading and actually enjoying each book. My daughter's favorite has to be Lately Lily, a book about a girl and her adventures traveling. She said it reminded her of when we go to our yearly trips to California to visit family and all of the new places she gets to visit and learn about. My son of course loved Here Comes Destructo-Saurus! I think he loved how cool the dino looked more instead of how he was acting. He mentioned a couple of times that making a mess and throwing a tantrum would get that dino in time out. We definitely enjoy seeing our kids read and hearing how excited they are during the book and once they finish reading their book. The fact that they go straight to their bookshelves in their rooms now and pick out a book they want to read before bed makes me even more proud. My daughter has started chapter and series books and so far she is loving that she can read more than one book to enjoy her favorite characters. To find out more about these Spring Books and how to add them to your collection, be sure to check them out on Amazon, Kids Books and Indigo. Also be sure to follow RainCoast Books on Twitter for news about up and coming new books that both you and your child will love! Disclosure: All opinions are my own. I received the above mentioned books at no cost for the purpose of this review. No other compensation was received.